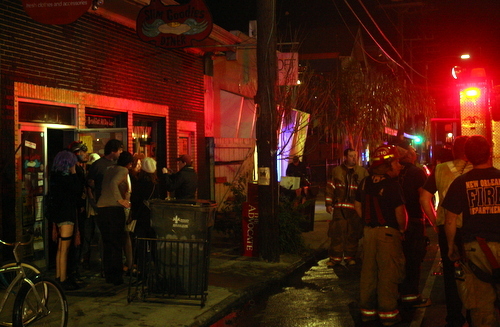 A small fire broke out Sunday evening in Slim Goodies diner on Magazine Street, but firefighters said there was little structural damage to the building and the owner said she hopes to reopen quickly. The fire broke out shortly after 7 p.m., well after the diner’s afternoon closing time, and was noticed by a passer-by who called 911, fire officials said. “I’d love to find out who that was so I can get him a bottle of wine or champagne or something,” said owner Kappa Horn after she arrived at the scene. Officials haven’t yet determined what caused the fire, but it seemed to be centered on the countertop in the diner, said Sixth District Chief Jaime Lampard of the New Orleans Fire Department. Other than that, most of the damage will be from smoke, Lampard said. Horn said the building has had electrical problems since she first began operating in it, lately centered around the main hookup to the building, and that she has had to call electricians, Entergy representatives and fire officials multiple times for the ongoing problems. But with the damage contained by the firefighters’ swift work, Horn said she hopes the repairs will be fast and the popular diner open again soon. Slim Goodies was one of the first places open after Katrina. A little fire’s not going to stop them! So glad to hear the photos survived! !